Lemon zest, freshly squeezed lemon juice, blueberries, vanilla – what’s not to love, especially in the Summer! 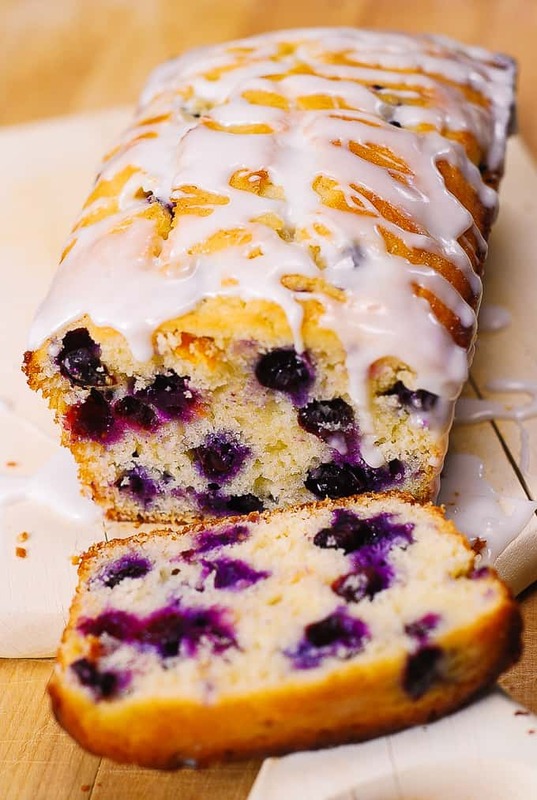 This blueberry lemon bread recipe with lemon glaze combines all these delicious ingredients to produce the ultimate breakfast, brunch, and dessert recipe good for all year around. Use 8×4 inch loaf pan. Use parchment paper. Line the bottom and two sides of the pan with the parchment paper. This will ensure that your lemon bread will not fall apart when you take it out of the baking pan. Use 2 separate bowls for combining dry and wet ingredients. Combine dry ingredients in one bowl. Combine wet ingredients in a separate bowl. Only then, combine the two together. Toss blueberries with flour (2 tablespoons) before adding them to the batter. This will help prevent blueberries from sinking. Do not overmix. Overmixing will allow gluten to develop more than you want and your bread will be tough and rubbery. For soft and fluffy texture – do not overmix the batter. Cool the lemon bread before glazing. Drizzle the top of the bread with the glaze only after the bread has been completely cooled. Otherwise your glaze will be too runny. Use fresh or frozen blueberries. You don’t have to thaw frozen blueberries, just use them as is. Coat blueberries with 2 tablespoons of flour. This will prevent the blueberries from sinking to the bottom of the breading during baking. The glaze is made from freshly squeezed lemon juice and powdered sugar. There is just enough glaze to cover the top of the lemon bread with a drizzle and not to overwhelm the overall flavor of this dessert! 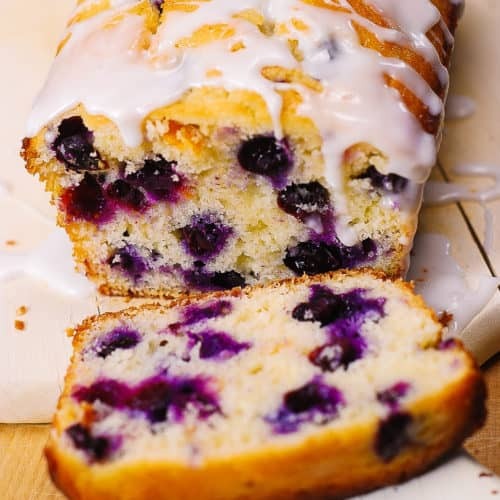 The slice (or two, or three) of this blueberry lemon bread is lovely early in the morning with a hot cup of coffee or tea. Keep lemon bread refrigerated. It keeps fresher and longer this way, plus the glaze keeps better, too. 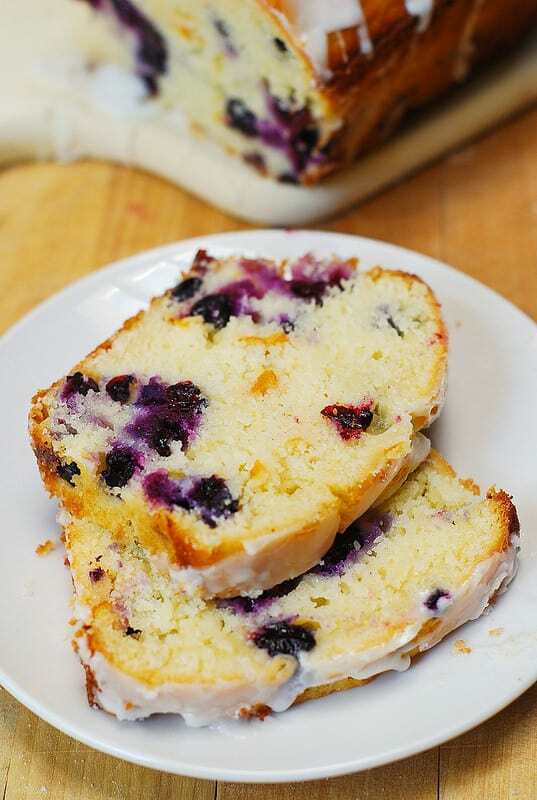 You can refrigerate the blueberry lemon bread after it’s completely cooled. To properly store the bread, cover it with plastic wrap, and refrigerate for up to 4 days. After you bake the bread, cool it completely before drizzling with lemon glaze. Also, make sure the bread is completely cool before you refrigerate it. Enjoy! 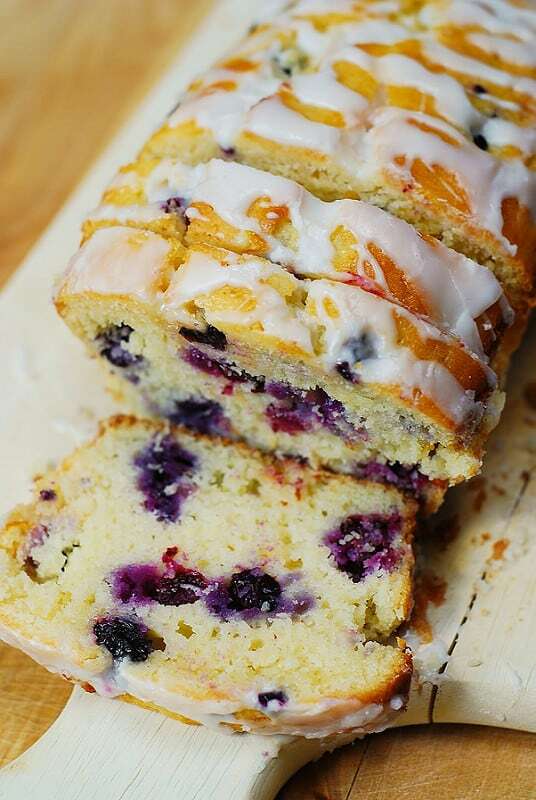 This delicious blueberry lemon bread with lemon glaze is a perfect breakfast, brunch, snack. Simple recipe, beautiful cake, what more can you ask for?! 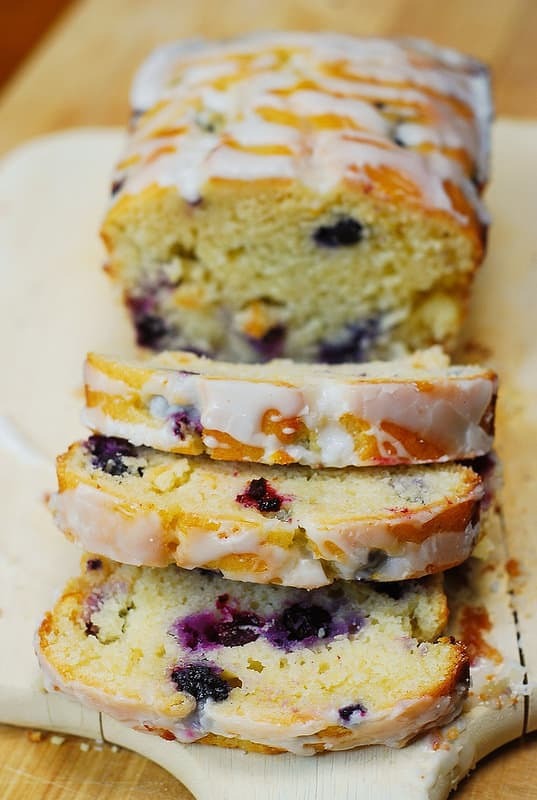 Lemon zest, freshly squeezed lemon juice, blueberries, vanilla - so many Summer flavors! Butter an 8x4 inch loaf pan, line the bottom and two sides of the pan with the parchment paper. In a mixing bowl, beat together butter, 1 cup sugar, eggs, and vanilla extract. 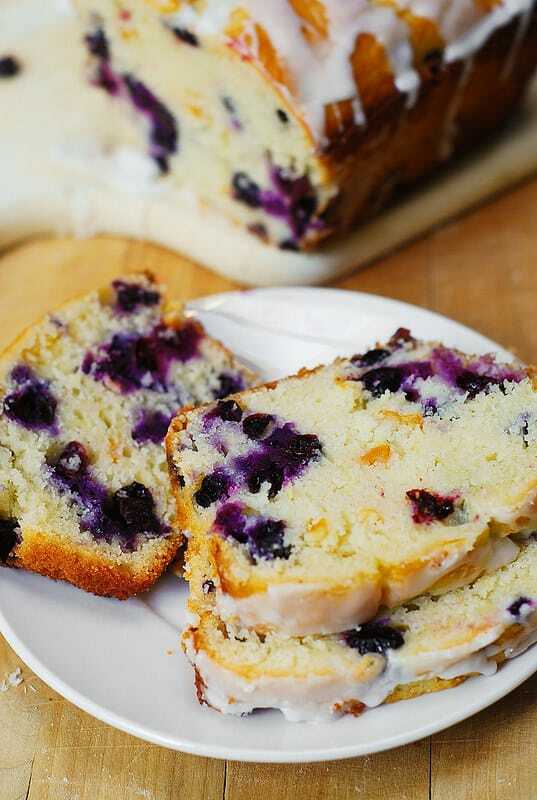 Fold in lemon zest, and blueberries into the batter. Do it carefully and fast. Pour the lemon bread batter into prepared pan. Bake in preheated oven for about 50-60 minutes, until a toothpick inserted into center of the loaf comes out clean. Cool bread in pan for 40 minutes on a wire rack. Release the bread from the pan. Combine freshly squeezed lemon juice and 1/2 cup powdered sugar in a small bowl and beat, using electrical mixer, until smooth glaze forms . Drizzle the top of the blueberry lemon bread (after it's been completely cooled) with the glaze. Some of the glaze will go down the sides of the bread. loved your lemon loaf with blueberry’s, it’s a real keeper. This is one of my favorite treats ever! I have to force myself to share with my children!! Delious the whole loaf was gone the first day. Another great Sweet Bread recipe. Blueberries are one of my favourite fruits so baking with them is a bonus. Took to a ladies lunch & came home with an empty plate. The glaze over the bread give a great flavour. So glad you liked it! Thank you for your comment!